Our WBB exhibition crossing eight borders was quite an experience! In addition to openings in train stations, we went through the entire train from time to time, inviting people to come to our rented car to view the “Boxes On the Train” exhibition. Some passengers stayed with us for hours into the night discussing the project. Everybody told us that this trip would be impossible. I like to do impossible things. In August 1996, the WBB exhibition was due in Graz, Austria. With St. Petersburg, Russia next on the schedule, conceived of an original idea. 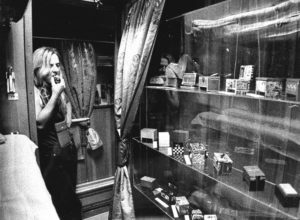 They installed the boxes in a rented train car, creating a moveable sculpture in a newly defined open space moving from Graz, Austria past Vienna, Budapest and Lvov, Ukraine and on to St. Petersburg. 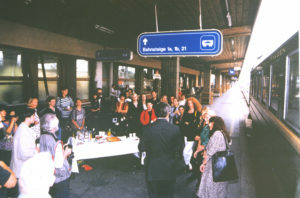 Passengers viewed the exhibition en route with presentations and receptions held in train stations along the way. 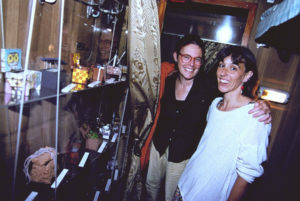 The installation was presented in a nostalgic sleeper compartment, beset with golden drapery, a silver tea service, three women artists, a writer, a photographer, two EDP experts, two Russian sleeper attendants, a laptop with an Internet connection, a video camera and 178 boxes from women artists all around the world. The exhibition crossed eight borders on the way to St. Petersburg. This sculptural installation, which took its form from the transport process itself was open to all the passengers on the train. Passersby became guests, tours were conducted throughout the WBB wagon. Both the purpose and the itinerary of the trip were published and recorded. Apart from the press-conferences, publication of the event was mainly concentrated on the internet. 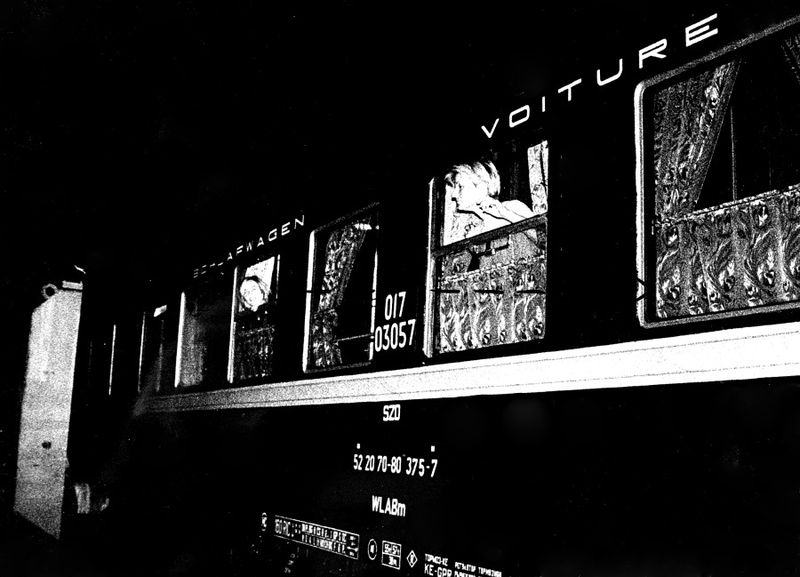 The wagon functioned as an ‘analogous’ gallery and a mobile interface between its journey in real space and its virtual correspondence to a “digital gallery.” An online event was planned between those on the train and the artists left behind in Austria and in USA for the exhibition’s arrival in St. Petersburg. Before we set out we were repeatedly told, it would be impossible to travel through all these countries with 178 artworks and arrive in St. Petersburg unscathed. We were also told that there were no general customs forms and no consistent laws between the new countries, and that we would probably be attacked and robbed by organized bands of thugs and thieves. Just an hour before we were due to depart, we received a call from the Austrian Ministry of Foreign Affairs, suggesting we should postpone the trip for an indefinite amount of time. Then, the Austrian Cultural Attaché in Budapest tried to stop us from setting out, saying it was all far too dangerous. 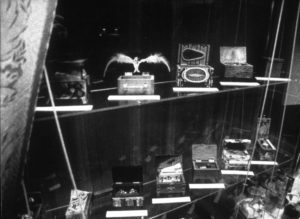 The idea of border-crossing exhibition with the sole purpose of establishing a world-wide communications network for women artists, overcome separations and find common ground to build upon, free of nationalism, began to appear more and more absurd the further we traveled away from our “Western civilization”. In Hungary, the customs officials let us pass, not without considerable interest, but the project came to a complete halt on the border of the Ukraine in a whirl of total misunderstanding. Everything became different here – not even the width of the train track remains the same: huge cranes heaved the wagon two meters up in the air onto a new substructure conforming to the Russian norm. The tone of the customs officials also changed dramatically – in the middle of nowhere, in the middle of the night, there was a heavy pounding on the compartment door, the sound of military boots, and harsh voices yelling “Control!”, with a hasty “No Camera!” following hot on his heels. After checking our passports and a wide-eyed inspection of the boxes, the officials stood there looking totally lost. Our sleeper carriage escorts, themselves not entirely clear on our objective, tried to explain. Our three-language (German, Hungarian and Russian) brochure was avidly studied with great shaking of heads. More officials were called, and, later on, the friends and relatives, wives and children filed through the exhibition far into the night. Our letter of recommendation from the Austrian Consulate in Moscow (written in Russian) was also thoroughly examined, drawing a few smiles and timid friendliness. Our initial fear was replaced with a sort of fatalistic relaxation. These villages were not even marked on the map and we were surrounded by foreigners as far as the eye could see. Just what exactly were they supposed to do with us? It was obvious they thought we were somewhat crazy but, nevertheless, harmless. The one stark certainty was that they did not want to keep us in their country under any circumstances. A considerable relief was clear all around when some reason could be found to help us continue on our journey. This, however, did not occur without some hiccups. The customs document we had allowing us to take the boxes out of Austria disappeared after one customs check. Then, when we arrived in Russia, we were informed our visa was only partially complete, the part allowing us to leave the country again was missing. It had probably been retained when we had left Belarus. Our arrival in St. Petersburg finally took place after a 64-hour, 40 minute trip, including a twelve-hour delay. In the event, the WBB Internet-Exchange between Graz and Santa Barbara had taken place without us 12 hours before we arrived, and the invited journalists were long tucked up in their beds. 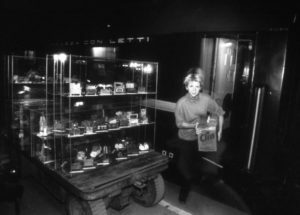 The porters wanted to charge thirty dollars for moving the boxes one hundred meters, and Polina Fedorova, responsible for the W/BB exhibition in St. Petersburg, had no idea where to store them. All the next day was spent in the Austrian Consulate and the Russian Ministry. We were in the country illegally, the whole situation was totally impossible, and we weren’t even supposed to be there. After a long period of arguments batted back and forth, we were given a new visa (again in exchange for more dollars), and a resting place was found for the boxes. When Polina had finished reading our letter of recommendation, she turned us with a laugh: In Russian there is no term for borders, only district control. As a result, given this translation, Women Beyond Borders means ‘Women out of Control’.